The NAP locked down browser is used in assessments to stop students from using other applications or websites during assessment events. To download and install the dmg file for MacOS use this link, for further detailed references see below. 1. Use the Locked down browser link under tools and resources on the Online National Assessment Platform home page. 2. Select the appropriate button to download the NAP Locked down browser application (app) onto your device. The (.dmg) version is the simplest way to install on a single machine. Note: All devices need to be connected to the internet so that you can download the app and install it. 1. Locate your downloaded file called NAP Locked down browser.dmg file and double click the file to launch the installer. 2. 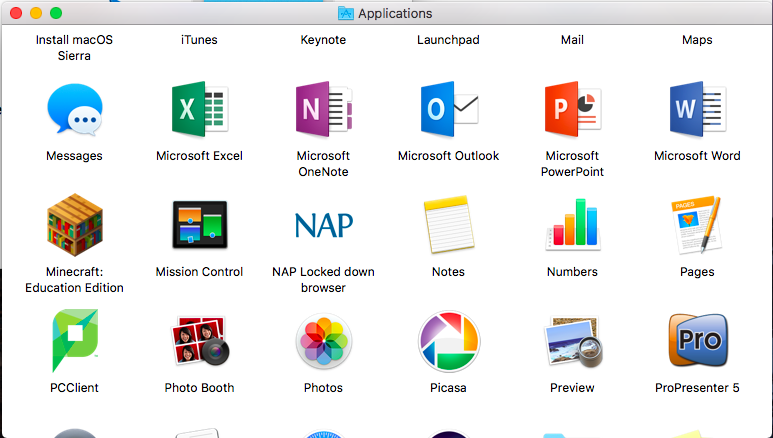 Drag and drop the NAP icon into the Applications folder icon. 3. Close the installer window. 4. 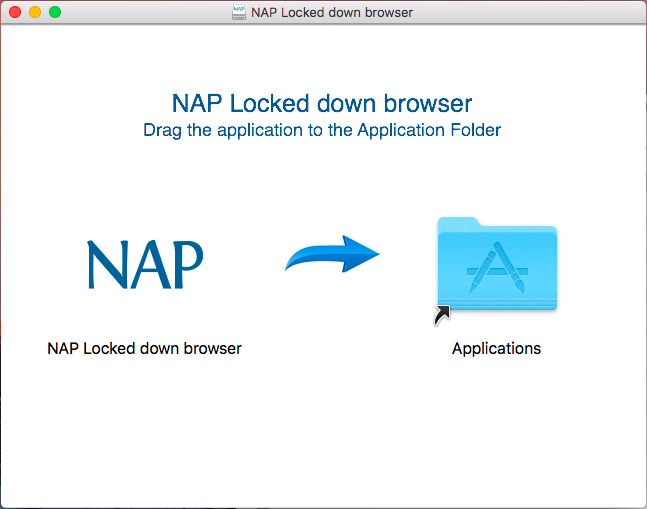 Navigate to the Applications folder and locate the NAP Locked down browser app. 5. Double-click the NAP app to launch it. 1. Using the operating system Finder app, search for the NAP Locked down browser in the Applications folder. 2. Select NAP Locked down browser. 3. Refer to ‘Connection steps’ at the end of this document. You can exit the app by selecting the in the bottom right on the student login screen (and other screens before starting the exam). Once you are in an exam session, a Test Administrator must pause your attempt, and from the pause screen the user can log out (returning them to the student login screen where they can then exit the app using the X button at the bottom right). If there is a connection disruption (ie the app cannot communicate with the server), the student can exit the app from the disruption screen. There is a keyboard shortcut for exiting the app. 1. Press Command + Q. 2. Drag the NAP Locked down browser to trash. 3. Follow the download and install instructions earlier in this document to install the updated application. 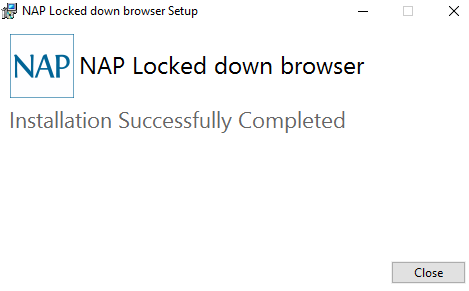 These steps can only be performed after you have exited the NAP Locked down browser. 4. Using the operating system Finder app, search for the NAP Locked down browser in the Applications folder. 5. 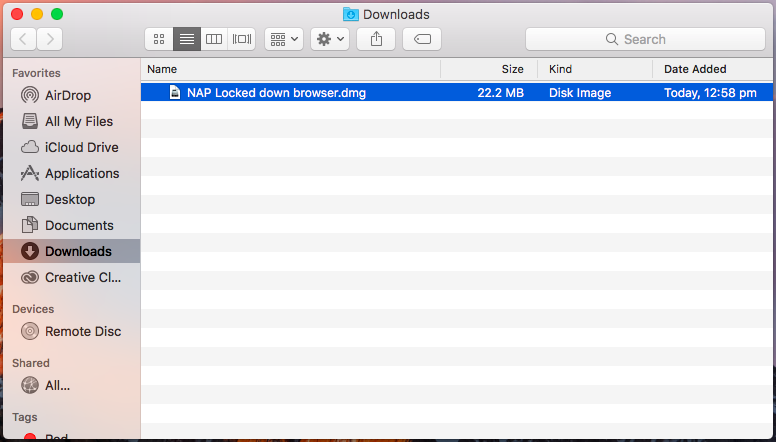 Drag the NAP Locked down browser to trash. When you start the app you will see the Launchpad. 1. Select Platform trial and readiness test. 2. Wait while you are connected to the server. 3. Enter the provided session code. 2. Check the device. Refer to the Technical Readiness Testing user guide. 3. Select Back to return to the Launchpad. 1. From the Dock, open System Preferences, then click Keyboard. 2. Open the dropdown menu for Touch Bar Shows, and select Expanded Control Strip. 3. Open the dropdown menu for Press Fn key to, and select Show F1, F2, etc. Keys. 5. Drag the Siri icon off the Touch Bar and onto the panel shown in the screen capture above. 2. Select the Dictation tab. To download and install the msi file for Windows 10 use this link, for further detailed references see below. 1. Use the Locked down browser link on the Online National Assessment Platform home page. 2. Select the appropriate button to download the NAP locked down browser application (app) onto your device. Windows 8/10 (msi) If you already have .NET 4.5.2 or later installed, use the .msi file. Windows 7 (exe) If you are unsure if the computer has .NET 4.5.2 then use the .exe file. Navigate to the locked down browser installer file (NAP Locked down browser.msi) using the operating system’s file explorer. The file by default will be in your Downloads folder. 1. Double-click NAP Locked down browser.msi and then the installation wizard will launch. 2. Select I accept the terms in the License Agreement. 4. Wait for the installation to be completed. 5. When the installer indicates that it has completed the installation, select Finish. 6. Verify that the NAP Locked down browser shortcut is available on the Desktop. 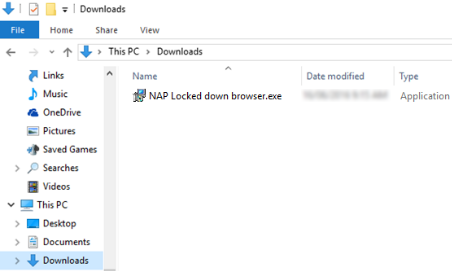 Navigate to the locked down browser installer file (NAP Locked down browser.exe) using the operating system’s file explorer. The file by default will be in your Downloads folder. 1. Double-click NAP Locked down browser.exe and the installation wizard will launch. It will inform you that the software will be installed on the computer. 2. Select I agree to licence terms and conditions and then Select Install. 3. 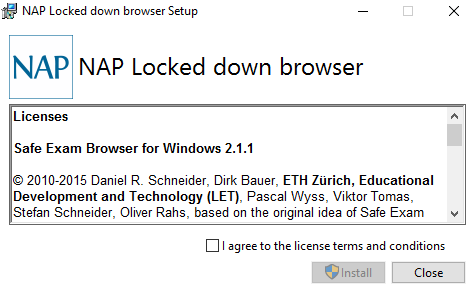 Depending upon your computer setup, you may be asked to confirm the install of the NAP Locked down browser. Select Yes. 4. Wait for the install to occur and then select Close.